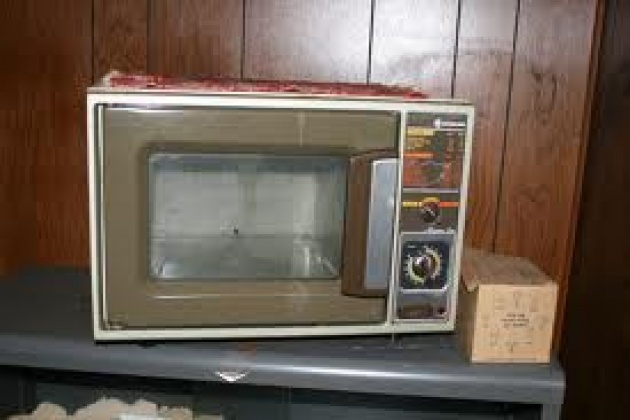 The microwave oven was another consumer product game-changer of the modern era. My family played a part in its history. In 1949, microwaves were used to develop radar systems for the military. One day a lab technician with a chocolate bar in his lab coat pocket got zapped! The rest is a story that would make any future Bill Gates salivate. At that moment, microwave cooking was born! The smart young technician knew the profit making potential of the device right away! He went to his superiors and told them he could make an electronic oven and he was successful. In the microwave oven's early years, the U.S. military developed mammoth microwave ovens to feed their large numbers of troops and support personnel. A decade passes before my mother had the bright idea to make a portable tabletop microwave. You see, my father Manny Sado had been in the appliance business since the 1930s, with his older brother, Harry. They formed Black Angus Broilers and Ritz Cookware. By the time my mother married my father in 1954, the company was extremely successful marketing a dozen or more different kitchen appliances, broilers, toaster ovens, waffle makers, donut makers, and electronic indoor/outdoor grills. Manny Sado was a visionary and product innovator and Sherry Sado was a marketing genius. The idea for a tabletop microwave was created over dinner by my mother. It didn't take much to convince my Dad to invest in the research and development in creating a small microwave oven that worked in smaller spaces. Sherry knew the challenges of New York City apartment living and was convinced her new model would be a winner. Since Black Angus already had the shell for the rotisseries, they needed to figure out how to shrink the magnatron, the cooking element needed to generate the microwaves. Instead of traditional cooking from the outside in, microwave cooking would heat the food's molecules to extremes and the natural friction against each other would cause heat and cook from the inside out. My mother and father were a great business team, and they endeavored to globally change the way people cooked foods. They started on this culinary adventure in 1962, and tragically my Dad died that same year, never seeing their vision completed. He knew it would work and his wife Sherry could deliver. And true to her word she did in 1965, when Sherry finally created the first working prototype of a table-top unit. In fact, my mother's design beat Amana's RadarRange by two years. Unfortunately, my mother never mass-marketed her table top microwave because the public was still wary of electronic cooking and the potential cancer risks. Scientific studies were still on-going, and soon after the formal introduction at McCormack Place at The Chicago Housewares Show, my mother sold the company to Sun Chief Electric, later acquired by Farberware.